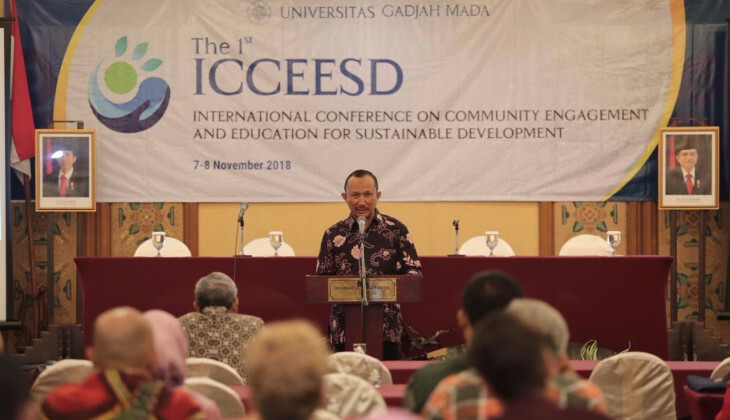 Universitas Gadjah Mada (UGM) through its Community Service Directorate hosted the 1st International Conference on Community Engagement and Education for Sustainable Development (ICCCEESD) from 7-8 November 2018 in Prime Plaza Hotel Yogyakarta. The event presented scientists from a range of disciplines hailing from Singapore, Thailand, Netherlands, France, Italy, and Germany as well as Indonesia. These include Prof. Suratman (UGM), Asae Sayaka, Ph.D. (Halal Business & Society Development Institute, Songkhla, Thailand), Saroja Dorairajoo, Ph.D. (National University of Singapore), Prof. Sunyoto Usman (UGM) and more. The conference is an international scientific platform for community service, particularly on Sustainable Development Goals (SDGs) at the local, regional, or global levels. Its goal is to map, synergise, facilitate, and socialise ideas on community service and SDGs for optimum realisation in countries. UGM Director for Community Service, Prof. Irfan Dwidya Priyambada, in his opening speech said the conference provided room for scientists, academics, industry, and government to share experience related to community service programme. This was part of the contribution regarding science and technology development that gives benefits to human beings. He hoped this conference would become the platform for scientific dissemination between academics and practitioners and of the conference would arise cooperation to publish journals and other publications as well as community service practices. In addition, strategic collaboration was expected to arise at the local and global levels. Conference chairman, Nanung Agus Fitriyanto, Ph.D., explained the conference raised the theme Innovating Engagement and Sustainability for Inclusive Society Welfare. It was divided into six sub-themes, namely: Community Services, People, Local Food Security;Training, Marketing, Appropriate Technology, Design;Community Empowerment, Social Access; Student Community Services; Border Region, Less Developed Region; and Education for Sustainable Development.